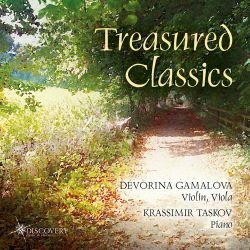 This CD includes a popular collection of highlights and virtuoso short form compositions for violin and piano and some new arrangements for viola and piano. There are many recordings of most of the pieces included here and naturally the question arises: why another one? The reason for undertaking such an ambitious task is that our approach to the music is from a slightly different angle � focusing more on expression and feeling rather than on showmanship. The viola as a solo instrument began to become more popular only in the 20th century and as a result there is a lack of short works prior to this. With these transcriptions, recorded on this disc for the first time, I have endeavoured to enrich the viola�s Romantic repertoire. Last but not least, the chosen works are my personal favourite short works, which I always thoroughly enjoy playing. This CD includes a popular collection of highlights and virtuoso short form compositions for violin and some new arrangements for viola and piano. There are many recordings of most of the pieces included here and naturally the question arises: why another one? The reason for undertaking such an ambitious task is that our approach to the music is from a slightly different angle � focusing more on expression and feeling rather than on showmanship. The viola as a solo instrument began to become more popular only in the 20th century and as a result there is a lack of short works prior to this. With these transcriptions, recorded on this disc for the first time, I have endeavoured to enrich the viola�s Romantic repertoire. Last but not least, the chosen works are my personal favourite short works, which I always thoroughly enjoy playing. Fritz Kreisler�s music, some of which was originally ascribed to others but was revealed to be his in 1935, reach utmost perfection in works such as his Cadenza for the Beethoven Violin Concerto. A highly gifted child he studied at Vienna and Paris Conservatories making rapid progress to become one of the most refined virtuosos with an enormously busy concert schedule. He also created many splendid arrangements of various works. Prelude and Allegro is one of Kreisler�s most brilliant works and is written in the style of Pugnani. Even though he uses Italian virtuoso techniques paying tribute to the Italian master under which name he composed it, preserving the stately Baroque form, the piece leans more towards Romanticism, with its rich virtuosic texture and long lines. He employs an extensive range of advanced techniques without making the music sound as if it were a study. It grips both the player and the listener from the very first note and does not languish till the last, demonstrating Kreisler�s ability to sustain intensity of expression without diluting it in extremes. There is one recording of this piece by Kreisler himself; it displays the versatility, simplicity and ease of his elegant Viennese playing style, the clarity and the cleanness of his tone. No matter how many excellent recordings made now or in the future, his own will always stand up as the benchmark. Yet, the improvisational manner in which he writes leaves room for new interpretational approaches. French composer Charles Gounod composed one of the most beloved tunes in the classical repertoire during his studies as an improvisation and in 1952 as Méditation sur le premier prélude de Bach. To this somewhat romanticised yet simple and pious melody he added in 1959 the text of the Latin prayer �Ave Maria�. Gounod adored Bach [1785-1850] and was himself deeply religious throughout his life. Thus he wrote many sacred works and even considered entering the priesthood. He regarded the Well-Tempered Clavier as "the law to pianoforte study ... the unquestioned textbook of musical composition�. Ave Maria has been arranged and performed in many different adaptations. The first exposition played on viola and the second on violin is premiered on this recording. This setting gives a wider register, the rising pitch symbolising the ascension of the prayer from the deep depths of the earth up to a celestial realm. The first and the most notable of Gluck�s "reform� operas, in which he attempted to replace the superficial plots and the overcomplicated ornate music of Italian opera seria with a "noble simplicity�, was �Orfeo ed Euridice�, written in 1762. It was drama and not the singer that Gluck focused upon. He not only contrasted and outlived the old tradition but laid the foundations for Mozart, Beethoven, Weber and Wagner operas. With Orpheus he outlines the image of the hero undertaking difficult rescue-missions in which he must control and conceal his emotions, an image that has been carried on into German opera. Gluck followed Homer�s tradition in which Eliseum (the imaginary paradise in Greek mythology) was still located in the Underworld. Orpheus decides to go there and to plead for his departed wife. On the way he has to pass the gate of Hades which is guarded by the Furies and he aspires to win their hearts through the beauty of his songs and lyre playing. The scene that ends with "Dance of the Furies� is followed by the Second Scene in Act II where Orpheus has reached Eliseum. This marks one of the most gorgeous moments of the opera. The idyllic bliss is depicted with classical simplicity in the gracious �Dance of the Blessed Spirits�. Originally written for solo flute with string accompaniment, the music here is imbued with pastoral tranquillity. This gets interrupted at times by suppressed anguish with its longing appeal that perhaps reflects the eagerness and desperation of Orpheus to get Eurydice back. Towards the end serenity reoccurs in which reflects some hope that his request will be heard. �The Dance of the Blessed Spirits� received lasting popularity in its own right and has appeared in numerous arrangements, one of which is Kreisler�s adaptation for violin and piano that he simply named Melody. The Rondo was originally composed by Mozart as the fourth movement of an eight part orchestral Serenade [K.250], commissioned by Haffner, a Salzburg businessman and friend of Mozart, for the wedding of his sister. The Serenade in time became so popular that Kreisler decided to develop the Rondo into a solo piece for violin and piano. Preserving the elegance, livelyness and lightness of Mozart�s music, he incorporates a �sparkling bouncing stroke� that is used most of the time throughout. Kreisler added also three virtuoso cadenzas providing additional challenges and delight to this most enjoyable piece. Full of youthfulness, freshness and enthusiasm, the Rondo remains one of my favorite choices. Tchaikovsky describes the feelings that "course through one during composition of an instrumental work� as a "lyrical process�, "a sort of confession of the soul� and compares it with the creation of verse but points out that "music possesses much richer means of expression and is a more subtle medium for translating the thousands of shifting moments of the feelings of the soul�. Indeed, he expresses the richness of human emotions in an unattainable depth and power. He is not just a "singer of Russian soul� but of the human soul in general. The warmth and humaneness of his music evokes our most noble aspirations allowing us to communicate with composer�s genius. In 1878 Tchaikovsky wrote a set of three short pieces titled Souvenir d�un lieu cher � ("Remembrance of a Dear Place�) in appreciation of Nadezhda von Meck�s hospitality, who had invited him to work at one of her country estates (Brailov). Although the hostess was never present, the place offered Tchaikovsky perfect conditions for composing and reflection. The last piece of the "Souvenir� is based on a beautiful heartfelt melody which Tchaikovsky also describes as a "chant sans paroles�. The captivating singing line interrupted by a playful and gracious middle section, is imbued with a child-like sincerity. Full of elegance and charisma, this piece is always a delight to hear and to play proving Tchaikovsky�s famous words that "melody is the soul of music�. Henryk Wieniawski was described by Anton Rubinstein as the "greatest violinist of his time�, an opinion generally shared by his contemporaries. He invited Wieniawski to St. Petersburg Conservatoire and from 1860 to 1872 he taught there, played as solo violinist, was court concertmaster to the Czar and led the String Quartet of the Russian Musical Society. From 1872 to 1874 Wieniawski toured the United States with Rubinstein and in 1875 replaced Henri Vieuxtemps as violin professor at the Conservatoire Royal de Bruxelles. He possessed fabulous left-hand pizzicato, harmonics, double stops and also one bow staccato called after him "the Wieniawski stroke�. Like most nineteenth-century virtuosi he also composed for his instrument and many of his works remain in the repertoire to this day. Légende in G minor was written when Wieniawski�s engagement to Isabella Hampton was opposed by her parents. The title does not refer to a specific legend but perhaps it relates to Wieniawski�s own experiences. Its narrative and nostalgic longing embrace the listener making them part of the tale. The stream-like introduction reminds of legend-telling rivers. The violin takes over delicately with an enchanting melody which later is repeated in full sonority. In the animated central part, which moves to major, the violin enters with a soft melodic line in double stops with a syncopated accompaniment. Wieniawski then gradually intensifies the dramatic expression and leads the piece to its climax. Following a rapid descending chromatic scale and a passionate conclusion we arrive at the opening part but in an even quieter mode, that sounds as a distant reminiscence, gradually fading away with some ascending and descending arpeggios. After Isabella�s parents heard the piece, they were so impressed that they changed their mind and approved the marriage. Folk themes had always been essential for Brahms and they were at the core of his works. His interest in folk music extended to those of other nations. He familiarised himself with Hungarian Gypsy music via his friend the violinist Eduard Remenyi in the 1850�s and his appreciation for it remained until the end of his life. He accumulated so much that he often incorporated elements of it in his compositions. One of his most popular set of pieces to evolve from this influence of folk music was the 21 Hungarian Dances of which he wrote that �they are incidentally genuine children of Puszta and Gypsies � not, therefore, created by me, rather just reared on bread and milk�. Only No. 11, 14 and 16 are entirely original works. Written initially for piano four-hands the Dances have been transcribed into many different settings. The best arrangements for Violin and Piano belong to Brahms�s great friend and contributor to his violin compositions � the exceptional Joseph Joachim. One of the most vibrant and popular of the whole set, Dance No.2, is recorded here for the first time in an adaptation for viola based on Joachim�s violin version. "Music is not a means for entertainment. It is an art which like poetry, theatre, philosophy, prompts the listener to go deeper into their thoughts and soul lifting themselves up spiritually�. This was the credo of Vladigerov, the most celebrated and emblematic musician in the history of Bulgarian classical music, described as the "Patriarch of Bulgarian Music�. Born in 1899 in Z�rich, from a Bulgarian father and Jewish mother, who was related to Boris Pasternak, he studied piano and composition in Berlin. After his graduation he became music director at the Deutsches Theater in Berlin but had to return to Bulgaria in 1932 because of rising anti-Semitism. In Sofia Vladigerov taught for many years as Professor of Piano, Chamber Music and Composition at the State Academy of Music, later named after him. He tutored generations of substantial musicians, leaving an unforgettable mark on them. He received numerous prestigious awards like the Mendelssohn Premium Prize awarded by Berlin and the Herder Prize by Vienna University. Dmitri Shostakovitch is known to have said about his Symphony "Jewish Poem�, dedicated to Vladigerov�s granddad Leon Pasternak, that "a work like this is written only once in a hundred years!� Vladigerov underlines that folk song was the essential for his work and marks his entire compositional style. Vladigerov like Brahms considers folk song as his ideal, and sees folk music as "an unceasing inspiration� that "can be used in endless different ways� and is indispensable for preserving the national identity of musical works. Following this principle he composed Bulgarian Suite. Op. 21 in 1926 for piano and in 1929 transcribed its second title, Song, for violin and piano which became one of the most memorable Bulgarian Classics. Based upon a deep-felt reflective tune using what is typical for Bulgarian and Jewish folklore augmented seconds and ornamentations, it is masterfully constructed and the two instruments intertwine with each other in a very concentrated texture with both parts being equally demanding. Considered as the leading Spanish composer of his generation Manuel de Falla (1876-1946) is described as representing "the spirit of Spain at its purest�. His first major work, the prize-winning verismo opera, La vida breve (The Brief Life, 1905/revised 1913) was mainly appreciated for what was unusual for the time, that of equal usage of orchestral music to singing, including sometimes a wordless chorus treated as if part of the orchestra. Today it is mostly remembered because of the orchestral Interlude and Dance and even more so because of the adaptation of the latter for violin and piano known as Dance espagnole. This Kreisler transcription can be considered to be amongst his finest. There is excellent balance between the violin and piano parts employing exciting and challenging violin techniques which serve the character of the piece perfectly, supporting it with an urging rhythmical and virtuosic accompaniment. It portrays a whole range of feelings galloping into a vigorous dance, briefly interrupted by a passionate singing middle section. Like Tchaikovsky, Shostakovich was convinced that "melody is the soul of a musical work�, "it is thought, it is movement� and that "true music is able to express foremost humane feelings and ideas�. The famous Romance is from the film "The Gadfly� , which is based on the very popular novel, of the same name, in Soviet Russia. It is the leitmotiv of the dramatic relationship between the two main characters - the romantic revolutionist Arthur and his father Cardinal Montanelli. It is believed that the Irish novelist Ethel Lilian Voynich wrote the book basing it on a true story of the fight for freedom of Italy against Austrian invaders. Neither book nor film would attract my attention was it not for the brilliantly written film score by Shostakovich. It proved his worth as superb film composer able to reach the hearts of even the monstrous Soviet authorities. The adaptation of the Romance for viola and piano is based on the original in the actual film and is only slightly different from the best known version of it in The Gadfly Suite, Op. 97a. This piece is an adaptation for viola and piano of the famous aria Mon coeur s�ouvre � ta voix from one of the most remarkable works of the French composer Saint-Sa�ns - his opera "Samson et Dalila�. It is about betrayal and love � two factors which often come together. Music has the power to express, in a unique way, the nuances and the many different layers of passion that lead to a double betrayal. Dalila not only betrays Samson but also betrays love. Samson on the other hand, an Izraeli Nazirit, betrayes himself by breaking his vows to God and also his people by giving into the seductive words of the Philistine. Before losing his physical strength, by declaring that the secret of his power is hidden in his unshorn hair, Samson is deprived of his spiritual steadfastness and lets himself be weakened by Dalila�s charm. No one depicts the inner drama and tragedy of the two characters more movingly and expressively than Saint-Sa�ns in this aria, full of passion, intensity and contradictory feelings. Transcriptions are always a compromise but they can also be an enrichment that opens a new dimension of expression and the viola with its dark sound and wide melodic range brilliantly transfers the multitude of emotions in the music. Among my most beloved pieces is Meditation from Jules Massenet�s lyrical opera Tha�s. In the core of Anatole France�s novel, after which the opera�s libretto was created, is the legendary life of St. Tha�s of Egypt. The Meditation is the turning point in the life of the courtesan, her inner transformation uplifting her into a spiritual renewal. In the opera this is depicted through an instrumental interlude between the two great duets of Tha�s with Athanael, who is trying to restore her to a life of virtue. The pagan Tha�s is impressed with the words of faith of the Christian monk and asks Athanael to leave her time for reflection on her own. At that point the violin steps in with the magnificent tune of the Meditation. In this hour of thought Thais faces the abyss of her corrupt and empty life. Her soul is taken through a dramatic inner fight in the middle section that evokes feelings of regret and repentance leading to her decision to radically change her life. After the reoccurrence of the main theme the music gradually calms down and expresses the emergence of faith and enlightenment. A fabulous virtuoso Pablo Sarasate grew up as a prodigee and studied in Madrid and Paris. Not only his incredible and intoxicating technique but foremost the beauty and purity of his tone and his refined, unsentimental performing style contributed to his artistic excellence. He impressed not only audiences but also his fellow musicians and was the dedicatee for works by composers such as Saint-Sa�ns, Wieniawski, Lalo and Bruch. They were influenced also from the Spanish element of his music since he, like most of the great violinists of his time, composed for the violin himself. Most of the works he wrote to showcase his mastery. Full of acrobatic inventions interwoven with little charming tunes, they are excellent challenges for advanced violinists. Yet their artistic merit is not of essential significance except perhaps the piece named "Zigeunerweisen�, which is his most celebrated work. It was written and premiered in 1878 in Leipzig and thus heralds its title in German meaning literally �gypsy tunes�. Th is indicates the source of inspiration, the music itself echoes not only the sorrows of these people, the hardship and sentiments of their unsettled nomadic existence but it also conveys the joy that comes with the collective style of life, free of entrapment. Th e piece is beautifully constructed with a long improvisational introduction displaying a wealth of emotions, colours and techniques leading to the soulful and nostalgic middle section that is followed by �csardas� like dances, dazzling with its energy and instrumental ingenuity in its conclusion. Th is work is particularly close to my heart as through my path in life I can completely identify myself with the emotions set into it. I am convinced that its moving message will continue to bestow people with love and delight.